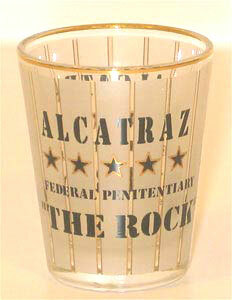 Text on the glass: ALCATRAZ, Federal Penitentiary, THE ROCK. All order for the shot glasses will be delivered thru the Post Office unless the shot glasses are purchase along with any display cases, although the shipping underneath states that it is thru UPS ground. That is because the UPS Ground mentioning is by default and we cannot change the wording there. Please make aware of this before you purchase. If you want to ship thru UPS the minimum charge is $8. Please contact us if that is what you want.